First of all, what is a CC Cream? You’ve heard me talk about BB Creams, and they are fantastic, all purpose wonder products (though some are better than other). The same is true for CC Creams, there are great, horrible, and meh products. But with all the hype out there for BB, CC, DD and what the heck creams, let’s do a little background. CC, in this case, is used for Color Correcting or Color Control cream. Just like BB creams, the first versions came out of Korea and the Asian market, where a CC cream is a BB cream with more features and benefits like redness reducing, light diffusing and correcting pigments. Another critical factor in a good CC cream is a powerful SPF, which is critical for all of us i we’re out in the sun for more than 5 minutes. SPF is one of the best anti aging tools out there! As a kid, I spent a lot of time in the sun – skiing, swimming, playing. Unfortunately, my Irish & German coloring didn’t like it when my Sea & Ski sunblock wore off – or when the Coppertone Tanning Oil did nothing but help me sizzle at the beach. So, here I am in my early 40s paying the price. From discoloration to sunspots, I am pretty damn lucky that I have no signs of skin cancer. This Irish & German lass turns pink after sitting in the sun for an hour so I’m always looking for products that are multi taskers. I admit, I was skeptical when I first got this product after trying many BB creams that just didn’t do anything for me. But the IT CC Cream is different. Because it’s many products in one, unless I’m having a really dry day, I can jump from the shower and put CC cream on after, skipping the moisturizer, primer, foundation and setting powder. This medium-full coverage product is highly pigmented, but doesn’t look fake or masky. I’ve played with a few application techniques and found that if I want lighter coverage, a flat paddle brush is wonderful for application, using a buffing brush to even out the application. Other days, I use my fingers to swirl on the CC cream in circular motions; the warmth of your fingers will melt the product in to your skin, giving a smooth and even finish that dries with a soft matte finish If you really have some problem areas, you can post conceal to cover and stubborn spots. I do find that less is more with the IT CC cream, so start small and build coverage until you find the right amount for your skin. The first time I used it, I was rubbing off all over the place and no one wants that! There is a lemon scent to this product, so if you are sensitive to smells – be warned. So, how does it work? 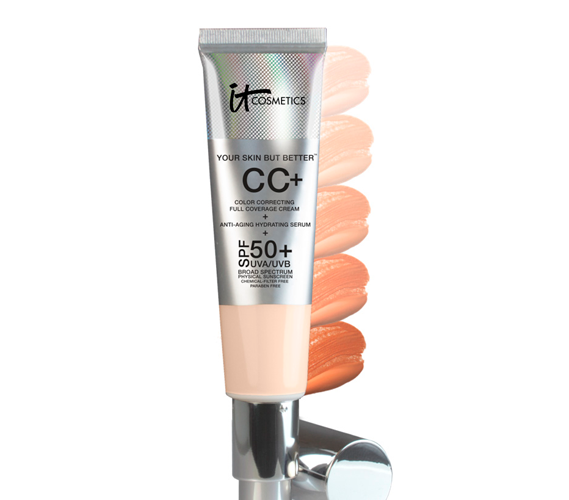 I personally wore the IT CC Cream for two weeks, forgoing any other foundation or skin care, to see how my skin responded. What I found was that my skin was smoother, silkier, and more even toned. NOw, I am a die hard IT fan, so to skip the 50 Primer and my regular routine was pretty tough – but I seriously noticed a difference after the first few days. The CC Cream is very moisturizing, so if you have oily skin or an oily T zone like me, I use a touch of Bye Bye Pores over those areas to lock in the cream and calm down any oily spots. If I’m having a day where I need more coverage or feel like I do, I pop my Celebration Foundation in my bag for touch ups during the day. I wear Light this time of year, but could get away with Medium in the summer. The shades are quite forgiving as it’s primarily skin care, with adjusting pigments. I will be repurchasing this product for sure! The best part? It’s skin care so you don’t have to worry about washing it off at night! Stay tuned, because next up is my review of the Tarte BB Primer, also something I love! Grade: A- – the scent is rather strong and I wish it was a bit less but it dissipates.